THIS IS WHERE I BLOG NOW!! Pretty amazing even on a rainy, n'est-ce pas? But the downsized-move from the suburbs to the big city completely undid me, as I handled it totally alone, given the demands of Larry's new job. I am 100% behind the eight ball when it comes to the marvelous contest that the exquisite furniture manufacturer Grange invited me to take part in. Remember last summer when I announced that I had been invited to design an "ambiance" (French for vignette) with Grange's popular directoire cabinet? Several bloggers were invited to participate and the blogger with the winning design would receive a trip to Maison et Objet in Paris in January, and could select a reader of their choice to accompany them!! 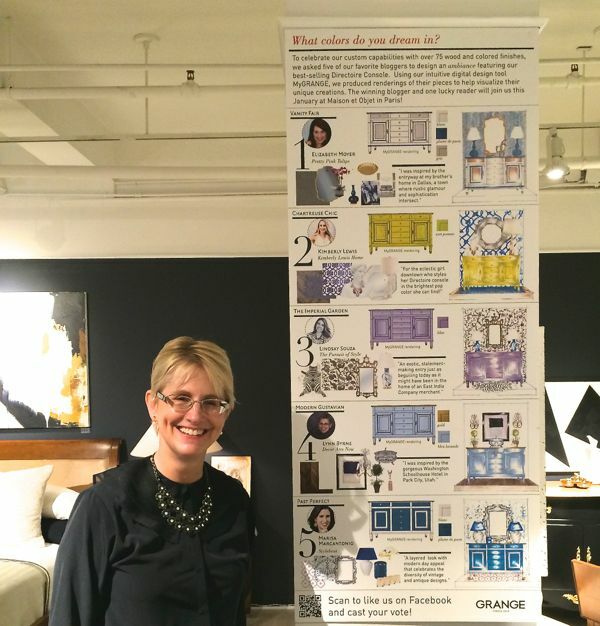 Back then I extolled the extensive virtues of Grange's ability to customize their furniture --and thank heaven I did it then because I am uncharacteristically late for this post. Grange offers an incredible 75 finishes and their craftsmanship can't be beat. Plus they have just launched the innovative rendering tool My Grange to help customers visualize their finished product. But I am one week behind. Mon Dieu! If you know me, you know that I am obsessively punctual so this is way out of character. My ambience was unveiled September 18 at the design industry's "back-to-school" night, known as "What's New What's Next "at the New York Design Center. I should have shared my ambiance with you on that date and encouraged you to get voting. The contest it tight--I have only four competitors--and all of them are completely stellar. I am honored to be included in this group. So without further adieu (yes, I am intentionally sprinkling in French words throughout this post, just to get you in the mood), here are my choices for my ambiance. I was inspired by the stunning, modern Gustavian look at the Washington Schoolhouse Hotel that I spotted and blogged about last winter while visiting Park City, Utah. In keeping with that look, I selected a blue-gray finish with some gilding for my cabinet and aged chevron floors. 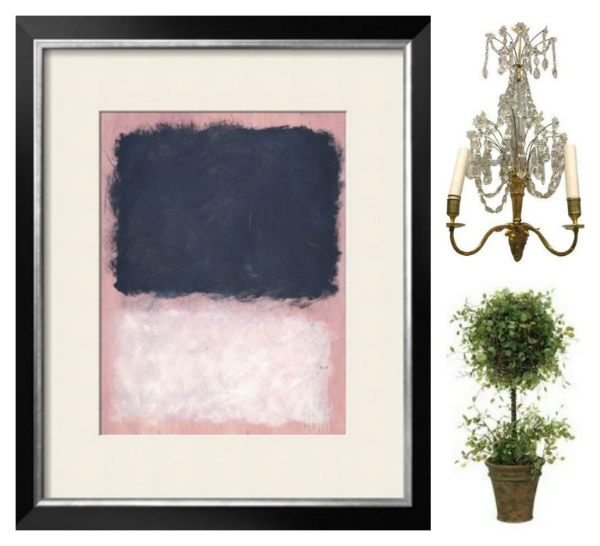 In true Decor Arts Now fashion, I chose top-tier art and antiques--a Mark Rothko, period Gustavian sconces plus a gorgeous antique silver lidded bowl -- and to remind all to remember the art in the little things every day, some greenery. I wanted an understated elegant look and I hope you think I achieved it. 1. First, you must like Grange on Facebook. 3. Some folks are simply leaving comments under Grange's main blogger contest post, mentioning the ambiance they like best. I think that works too. Everyone else has been drumming up votes for a week, so please help me catch up!! This post is sponsored by Grange.